If you’re looking for the secret to motivating call centre staff, you should stop by Noojee any random evening during the week. There, you’re likely to find several of the team sitting around the boardroom table – clearly deeply dedicated to their work. Developers, support staff and even the sales manager can be found deep in thought, surrounded by stacks of cards, many-sided dice and…wait – are they playing live action roll play games? That hardly seems to be an effective use of their time, surely. But in reality, what you’re actually seeing is a high performing team coming together, which is the key to motivating call centre staff too. Team motivation and a sense of unity doesn’t happen overnight – and it doesn’t happen as a result of your agents executing their job descriptions. For us, and for those of you managing an outbound call centre, building an effective and supportive contact centre team requires concentrated effort to identify and nurture the sort of environment that will pull a group of employees together so that they’re ready to encourage and motivate each other when the going gets tough. 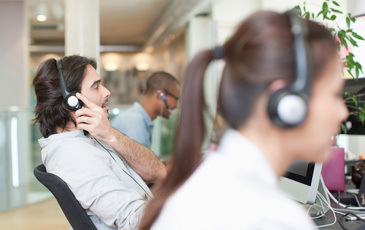 Even the best managers can struggle with motivating call centre staff from time to time, but by following these key principles, you’ll be able to keep your team productive, while helping to reduce the potential for turnover. Each of these actions will help make your company a better place to work which helps keep your current team happy, while also attracting top talent to apply. You may already be setting agents clear cut goals, such as, “Work to boost personal sales by 5%” or “Improve call times by an average of two minutes.” But evidence suggests that setting a team a set of goals that are over a range rather than a specific number can be more motivating. So instead of that 5% goal, perhaps you could challenge the team to achieve a 3-7% increase. Working in a call centre can be quite isolating; ultimately it’s just you and the dialler against the world. But by encouraging your staff to look out for each other and giving them more discretion to about how their team will achieve their targets can relieve some of the burden. Key to motivating call centre staff is letting your team know what their goals are, as well as any personal goals they should be reaching for. Then, make sure they have everything they need to accomplish them – whether that’s time to plan, additional training, or chat software to make getting help while on a tricky phone call easier. Speak up when someone on your team is doing a good job. Public recognition does wonders for motivating call centre staff. Praise sends dopamine through the brain, to release feelings of pleasure. It works to provide short-term rewards, but with repetition, can go a long way in helping your employees to feel valuable to the organisation. If you want to go beyond public recognition, consider offering cash bonuses to your highest performing teams on a weekly or monthly basis. Besides cash, consider providing a choice of prizes to win – gift cards, tablets, etc. Take a look at the available budget and determine what physical incentives would be possible, then talk with your agents about what they’d most be interested in working toward. People will make mistakes – it’s a fact of life. Rather than punishing a team for failure or mistakes, help them see the lesson they need to learn, and let them brainstorm what to do to avoid the mistake happening again. Encourage them, don’t put them down. Listen to what they have to say, rather than jumping to conclusions. Motivating call centre staff means letting the team explore mistakes, which can help them make fewer. Firstly they may be able to identify what caused it, and understand better how to avoid it in future. Plus they’ll learn that failure can be an option, reducing the pressure. People who are working under constant pressure aren’t as effective when they work. And by knowing there isn’t a penalty when reporting bad news, they’ll be more likely to come forward earlier, preventing the issue from being magnified. As a manager, it’s your job to manage your call centre overall, while allowing each person on the team to handle their own activity. Think of yourself as the ringmaster (whip and top hat are optional of course!) Yes, you need to check in to make sure everyone’s on track and make sure there aren’t any agents who are struggling, but micromanagement isn’t the only way you can focus on motivating call centre staff. When each team has clear goals, your agents are able to figure things out for themselves, and you won’t have to be over their shoulder or second guessing them. Allow all members of your team to communicate openly with you and one another. Encourage them to provide their input on how things should be done. They know their struggles better than anyone else out there, so they are a valuable source of information. Take their feedback to heart, and do what you can to implement their suggestions. Meetings are important to make sure everyone is on the same page, but keep them short, and limit them to only when necessary. If your employees spend too much time in meetings, that takes them off the phones and makes to harder to achieve targets. Create an agenda for your meeting and give it to your employees ahead of time. Only require those who must be in attendance to be there. Start on time. Move accordingly, and end the meeting on time. Of course, team motivation may waiver from day to day – sometimes you roll a twenty, and sometimes you feel like you’re facing hand-to-hand combat with a dragon. That’s to be expected, because the outbound sales climate can be challenging. But when employees are down because they’re not reaching sales quotas or they have a tough call, knowing they have the backing of the rest of their team will provide encouragement and motivation. And as long as your team knows you’re available to help them, they’ll feel more comfortable as an agent, and will likely be more productive as a result. For more hints and tips on motivating call centre staff to perform and achieve, download a copy of our free ebook, The Psychology of a High Performing Call Centre.